You don't have the cash to turn a truck into a glam-camper nor the time to Febreze the stank of marijuana out of a VW Westfalia. The small, simple, but seriously-capable off-road camper of your youthful dreams could have been the Daihatsu Mud Master C.
Toyota acquired the majority stake and effectively took the reins of Daihatsu in 2006. In 2007, the original D rolled up on the Tokyo Motor Show with this ultimate go-anywhere, hose-out, not-expensive masterpiece with a name (presumably) inspired by jungle-dwelling rapper. I was listening to Mud Master C before he "got clean" and went mainstream. You probably haven't heard of him. The Mud Master C was based on Daihatsu's Hijet van, with a little more width, a lot more height (14.5" of ground clearance), and hatch-style doors that opened pretty much the whole thing up to the elements. A three-cylinder engine was hooked up to engageable four-wheel-drive with low range, running power to the wheels with a hub reduction system that made the most of the little engine's output through gears mounted between drive shaft and wheel. The Hummer H1 uses a similar system. In so many ways, this thing is perfect. It'd be cheap to run, easy to park, and could run circles around something as ungainly as an EcoRoamer if you can live without the luxury. Sure, a Mud Master C might not be the greatest long-haul highway cruiser, but it's got practicality pegged in just about every other department. Hell, there were even some pickup truck configurations drawn up with a crane in the back! Alas, it was destined from the beginning to be nothing more than some show-floor eye candy. 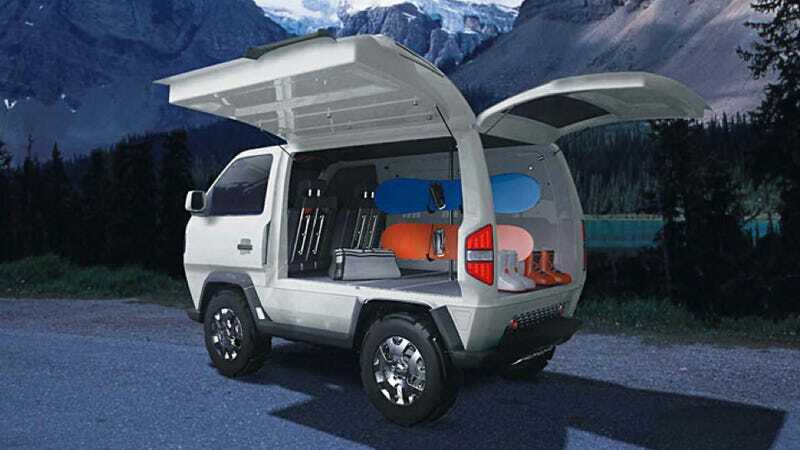 The idea of a Honda Element with real off-road capability and extreme simplicity of design. For folks looking for an ultimate lifestyle vehicle, this would have been hard to beat.